( Preface ) electronics super-stores, with branches among largest cities in North America . it is the ultimate evidence of development in this technical society . then in smaller nations : where whole set of blocks act as THE whole-sale district .. possible especially in post-modern cultures of concentrated living in the Orient . if Life would have it : I could write a two-dozen volume encyclopedia on this subject but, have to do others for a living thus ..
( How it came to be ) as South Korea developed after the 1988 Seoul Olympics and thrust to become an IT information technology Power over the Millennium, these consumer havens seem like silicon oasis where amazing devices could be had at a price . but only the first in Techno-Mart (see below) was a success and bore wanna-be’s but even they, now soon after the influx of On-Line Shopping Malls : some portions are barren as you can tell from empty booth lots on inter-connecting floors, where some are lent as periodical general apparel sales outlets – this is the first hint when you enter a floor of a supposedly-electronics-dedicated mall . ( Price-wise ) more-so, the myriad of stores in these buildings do not show prices up-front and a wondering traveler may fall easy prey . thus as mentioned many times over in my BLog, I advise visitors and expatriates to buy from electronics department of near-by supermarts, even though they carry much, much less variation in models . 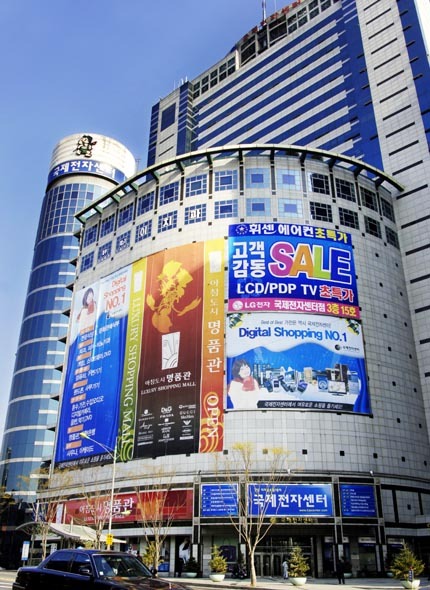 in the Capital of Seoul there are 4 major Electronic Districts where most are stand-alone dedicated buildings . in which case the opening dates mentioned are when store lots are filled, taking anywhere from half to a year from construction date . named with the term “SangGa” in Korean, loosely translated into “Market” but there are 2 most used words meaning “Market” in Korea : “ShiJang” and “SangGa”, where the former means more of open market selling fresh fruits & fish, while the latter used to describe : concentration of indoor stores in a large building selling hardware varieties . all very small compared to Seoul . TechoMart at SinDoRim newly opened December 2007 and taking off in May 2008 . a failed attempt to re-live the successful building of the original ‘TechnoMart’ (explained below) on the other side West, of the Capital . is not an electronics-specific building, but a marketing effort to lure consumers with a futuristic front image, while actually being a multi-store building . 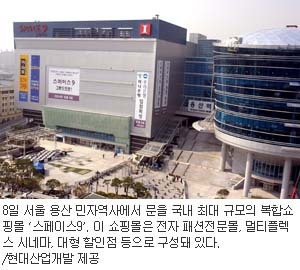 (versus the term “Department Store” in Korea, strikes a strong mode of high-fashion) but notable because ShinDoRim area is a major hub of Western Seoul where existing train station meet with subways, and the entrance to industrial and now digital production sectors of KuRo, and further into the satellite city of GwangMyung . this the old West-end of the Capital of Seoul, across the Han River . originally a relatively poor area, but now filled with medium-income residence apartments . Space 9 was intended as an electonics department store building, taking up the South-Western wing portion of the now-massive Yong San KTX Station, just one train station South of the historical Seoul Train Station also re-newed for KTX bullet train . this is the West-end of old downtown SEOUL, just BEFORE crossing the Han River West-ward . parallel Subway Line 4 ShinYongSan Station Exit 4 and directly in front across the road . 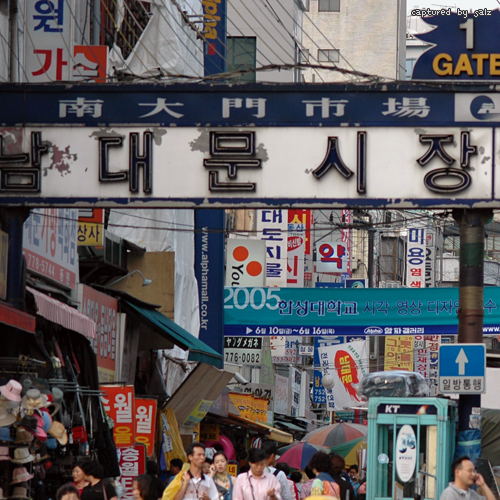 is a historical open market consisting of a whole vast block between South Gate (NamDaeMun) and fashionable MyeongDong . it sells EVERYTHING, from clothes to your daily Korean foods and the most famous being the Ghost Market “DocKaeBi ShiJang” in Korean, where pirated items such as rations from the U.S. Base and European liquor were sold in ’60’s & ’70’s when imports were solidly blocked, as in illegal . where tiny booths of independent consumer stores are cramped in a small area not even comprising the whole floor : everything camera-related from film to digital cameras AND accessories . Good-and-Good, former defunct SaeRoNa Department Store, is a newer camera store-gathered shopping building geared more towards the young, as the sales clerks are too, young trying to talk you into a buy no matter what . while you are here smack.in the middle of downtown, it is a good chance to yonder a few more buildings East-ward, onto ShinSeGae Department Store (the oldest and now one of the 3 largest in Korea) consisting of its main building “Bon-Jeom” and their new wing “Shin-Gwan” . then across the street a bit to the left is (really) Seoul’s Central Post Office where you CAN get help in English . and on the left alley – known as Chinese alley from the old embassy, where anything Chinese could be bought – is where all Japanese magazines used to be sold before the influx of Internet shopping malls (some still there). is a good example of a whole building dedicated to consumer electronics, where in other countries would conjure up a whole neighborhood of smaller buildings & shops . 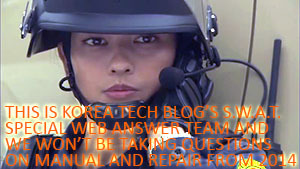 when opened in 1998 it was a grand success in part for most electronics are gathered downtown or West side of Seoul . (several building here-after are built and leased with this original ‘first’ electronics shopping-dedicated building as a model) but now depending upon the year there are bad seasons when vacant lots are rented to even clothing stores, mostly on the basement and underground level . with LotteMart for groceries & daily appliances at underground level . Subway Line 2 Exit 1 & 2 inter-connected underground . right across the tall building on the other side of the subway station is East Seoul Bus Terminal “Dong-Seoul-Bus-Terminal” serving other cities in South-Eastern areas . despite its grand official name on a mammoth building, it is a failure as only students seek the upper floors for a selection of game shops and scaled plastic model figures . but this is where the whole population on the South-Eastern half of Seoul come for games, mostly hand-held games . and interesting example of shopping buildings developed for electronics seeking consumers . surviving with most store-lots filled even in this lingering IMF market, for they have adapted to seek a niche market centering in on computer games AND toy figures, and as a result NOT widely known exactly because of this specialty market . so-much-so that I cannot recall what the other floors below were ..
located South of the Han River in the Southern end of KangNam, you might want to go further South 15 minutes drive to CostCo (OK, cool-down) for a round-up of missed groceries – explained further in Korea Expat BLog’s top menu Shopping Page . on the other side of the subway station via Exit 5 lies Seoul South Bus Terminal “Seoul-NamBu-Terminal” for express buses serving Southern cities outside of Seoul . HiMart like Electronics Land above, although both NOT large but occupying whole mediocre buildings and carrying multiple electronics brands . 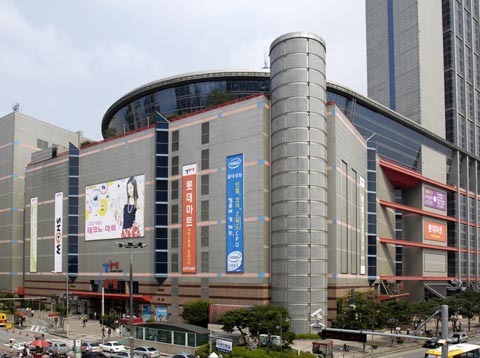 SuperMarts like CostCo, HomePlus, eMart, LotteMart, HomeEver and MegaMart (in Busan) run by conglomerates – THE recommended place to buy anything including electronics although few, explained many-times over on this BLog . in South Korea super-marts are about the only place you can linger upon items (electronic or not) without continuous comment from vendors . and they won’t give you that nasty look if you don’t buy – an uncivilized trait stemming from the hard post-war days . their small-electronics corner is a great place to try electronic dictionaries one-by-one to your liking . above is also in the order of price descending down-wards . the conglomerate show rooms charge retail price except during SALE, while the two independent vendors carry much discount BUT not rock-bottom as internet shopping malls, but super-marts sometimes compete with on-line shopping malls because they can in sheer volume, except they cannot carry a wide range of models because electronics is only a small portion of their massive business . Hi how are you, first, tank you for your blog it’s very informative and complete, i like to ask you if you know about a wholesale market for cell phone spare parts because i cannot find that information on the web, tank you i hope you know the answer. I am going to travel to South Korea soon. Where can I buy the latest computer desktop graphic cards (AMD & Nvidia)? Where can I buy the latest AMD CPUs, like the FX 9590? Welcome to the once Land of the Morning Calm – now gone WireLess over the Millennium . meaning : On-Line stores have the most variety AND lowest price, with the option of picking it up yourself for delicate monitors and HDD’s . 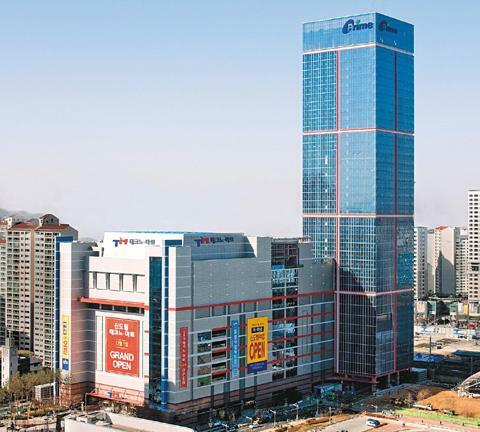 several stores in Seon-in SangGa building on the East-Side of YongSan Electronics Market district should provide you with all . their main entrance begins on the 2nd floor, where 3rd and even 4th floor would be best for you . don’t let the small booth-size fronts fool you, as some have extensive On-Line existence . AMD FX 9590 power-monger is not out in South Korea, although previewed and has just been released in neighboring Japan for under USD $400 . but better to get intel and in your case : 3770K if you plan to reSell when leaving the country – so Good Luck ! and no more questions on this please as CPU and graphics card debate is ever-endless .